What do you think of when you think of Savannah, Georgia? Do you conjure mental images of the cobblestone streets, dotted with towering lamps, beautiful cypress trees, and wrought-iron rest benches? Does your mind wander to the historic Southern homes and Savannah museums? Savannah is actually the oldest city in Georgia, with adventures and historic facts around every corner; making it one of the best places for loads of family fun and educational entertainment. From the ever-popular River Street, to the gracious hospitality and honey-drenched accents, Savannah GA offers an eclectic blend of genuine Southern charm that is sure to please. Known for its charm and old-world atmosphere, Savannah is the kind of place where nostalgia and contemporary coolness intermingle. While many of the Georgian must-dos and need-to-sees are historic, there are hundreds of entertaining and educational options available for travelers of all ages. Foodies can sip a mint julep or indulge in classic fried chicken, biscuits, and a pitcher of sweet tea. Sweet treat lovers will rejoice at Savannah’s Candy Kitchen. Pop in for a sample taste of famous Savannah’s Original Pralines, saltwater taffy, or hand stretched peanut brittle. 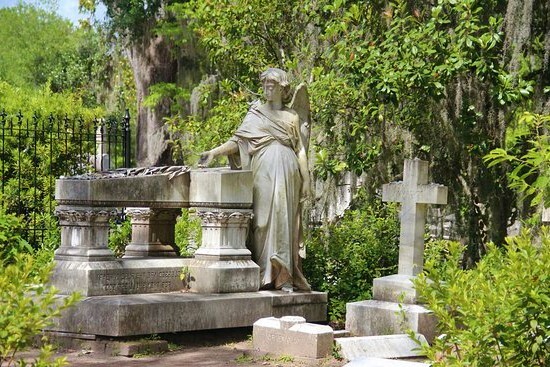 Historians that love a good spook will find fun and mystery in one of the revered ghost tours of Bonaventure Cemetery, where ivy-laden tombs and old crypts are rumored to house all manner of ghosts and ghoulish creepers. The cemetery became famous when it was featured in the 1994 novel Midnight in the Garden of Good and Evil by John Berendt. The Port of Savannah is ginormous, with well-over 50 piers and docks stretched across the Savannah River. The port bumps against Georgia Ports Authority and the historic Savannah Riverfront, and hundreds of ships and terminals are in operation. This Savannah Port boat tour takes history buffs on a 90-minute tour across the water to learn about the Port. This 3-hour on-the-water tour takes guests upriver to explore 29,000 acres of creeks, marshlands, and historic 18th century rice fields and old plantations. Guests will definitely see the beauty of the Savannah River, inclusive of diverse wildlife and a self-sufficient ecosystem. Described as luxurious and sophisticated, the Westin Savannah Harbor Golf Resort & Spa is an upscale waterfront resort, where visitors can relax their senses, entertain their minds, and soothe their souls. In other words, this resort offers all of the makings of an amazing vacation. The convenient location alongside the banks of the mighty Savannah River, makes it even easier for guests to enjoy outdoor activities offered through Outside Savannah. All tours and programs meet and depart from our desk in the lobby of the The Westin Savannah Harbor Resort. A view from The Westin Savannah Harbor Resort facing River Street. Visiting Savannah is an impactful, positive experience in and of itself, but Outside Savannah offers new perspectives. And why is that a great thing? Because a unique perspective allows you to learn more about Savannah, regardless of how many times you’ve visited in the past. We look forward to sharing our passion for the outdoors with you. For reservations, please call 800.686.6996. If you are a guest staying at The Westin Savannah Harbor Golf Resort & Spa, you can book reservations at the our Outside Savannah desk in the lobby. The resort property is located at 1 Resort Drive, Savannah, Georgia 31421.